I decided to take my reading out of my home by joining a book club at my local library. I went to my first meeting last month to discuss Quiet: The Power of Introverts in a World that Can’t Stop Talking by Susan Cain. I read it when it first came out in 2012, but went to the meeting anyway as I had enjoyed it and wanted to hear other peoples’ thoughts. This month, we read Come, Thou Tortoise, the debut novel of Jessica Grant. I thought I would put my reaction to it here first before talking it out in book club. Uneven. That is the first word that comes to mind when thinking back on this book. There were moments when I couldn’t stop reading and moments when I thought I could put it down and never pick it up again. I reached page 150 before I had a genuinely pleasurable moment. If not for the book club, I may have set it aside. But I am glad I pushed through. The traits that bothered me grew fewer in number as the plot deepened and the main character came out of herself. Come, Thou Tortoise tells the story of Audrey “Oddly” Flowers, a young woman with a below-average IQ, dealing with the death of her father and the loss of her Uncle Thoby, who lived with them for most of her life and who abandons her after the funeral. Her father, Walter, was a scientist trying to find the key to immortality by teaching cells to remember how to be young. Complex ideas like Walter’s work, or Uncle Thoby’s history, or how not to be afraid of airplanes are all presented through the explanation that makes most sense to Oddly. As her capacity to fully understand all that is occurring is diminished, so is the readers. 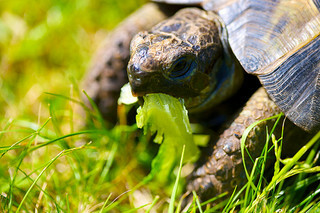 Mixed into this story is the experience of Winnifred the tortoise as told from her perspective as guest of Audrey’s friends (she is left behind when Audrey returns home) and as companion to Audrey and others over her long life. I really enjoyed Winnifred’s sections; her concerns for her own well being and for Audrey or other former housemates blend well with the larger narrative. Winnifred also provides a relief from the oddness of Oddly. Think about that. The narrative of a tortoise is more normal than the thoughts and actions of the human protagonist. Mostly this is a result of Grant’s use of wordplay. Oddly loves puns and uses them as a way to deal with or deflect from difficult situations – calling her father’s coma a comma, which I misread every time, or using French words in place of English, which worked well. The device is over used at the beginning of the novel, perhaps to help establish Audrey’s personality, but it got old pretty fast and I was glad when the plot made it more difficult to work the puns in organically. At times it is difficult to trust the narrative. Is it true or just wordplay? I like humour in my books, but often find books that are meant to be funny to be the least funny things I read. Maybe it is the expectation that I should be laughing at every page, but most often they are disappointing. While I laughed at times while reading Grant’s novel, I think it is a disservice to the story to present it as funny book. The heart of the book is the relationship between Audrey and the two men who made up her family. Walter’s death opens up many questions for Audrey, most of which have nothing to do with what you or I would consider important. A missing hamster. An arch-nemesis. Audrey takes for granted the stability of her family life, until Uncle Thoby’s disappearance forces her to look more closely at the people nearest to her and those she would keep at arms length. But my dad had explained this to me. That sometimes there is only one parent. Sometimes there are two. Sometimes there are three. But what it comes down to is who wants to be. And if someone doesn’t want to be, they shouldn’t have to be. And if someone does want to be, like my dad, who really really wanted to be…or like Uncle Thoby, then that person should be allowed to be. And that kind of love is something you should not say no to. Book club is tomorrow. I’ll be sure to update you on how other people took Come, Thou Tortoise. For more of my thoughts on this novel, check out my Twitter feed @rereadpages for my live tweets from reading this book under #comethoutortoise. If you’ve read this book, I’d love to hear your thoughts in the comments below.